Iris pallida is the Dalmatian iris a tall growing variegated species that is easy care. Reaching nearly 1m in height and with pale lavender blue flowers the flowers are bearded and very attractive. Flowering in spring the blooms have a subtle fragrance. Foliage is very long lasting and attractive year round. In the garden, Iris pallida is suited to a number of uses, a clump grown in the border adds structure with the tall foliage giving a year round presence. Also well suited to growing in containers, although you will need to repot every 3 – 4 years to maintain vigour. The name ‘pallida’ comes from the pale flowers which add a light touch to many planting schemes. The common name ‘Dalmation Iris’ comes from its origins in Dalmatia. With two varieties, the second is Iris pallida ‘variagata’, very attractive year round. You will find both varieties widely grown through Italy, its such a good garden plant that it has been in cultivation since the 1700s. Once established Iris pallida is particularly hardy and regarded as drought tolerant. It will grow more rapidly in a humus rich moist soil, however it copes well in poor dry soils as well. 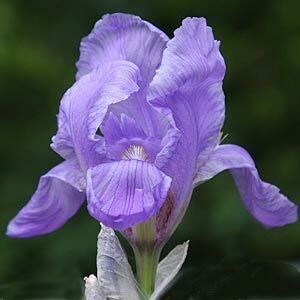 This is a species that will grow happily without division for many years, unlike most other bearded iris. Tolerant of light shade I. pallida makes a good clump forming plant for the dry border. Propagation is easy by division of clumps in late summer to autumn.